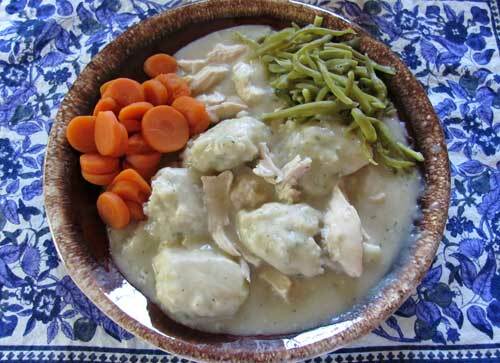 CHICKEN AND DUMPLINGS RECIPE -- Like Grandma use to make. Home cooking at its finest, chicken and dumplings. Easy chicken recipes are a dime a dozen and most fall short on the taste scale. Not so with this chicken and dumplings recipe. It's comfort food delicious. I've included two versions here. First, an old time southern traditional version. The second a quicker version that uses chicken leftovers. Both grade high for taste, satisfaction and ease of preparation. A hearty meal by itself, chicken and dumplings go best with a tossed salad and hard rolls and butter. Cooked greens and cornbread are also good sides. NOTES: My chicken and dumplings recipe uses drop dumplings, not the rolled and cut kind of dumplings. If you like, add cooked carrots, celery and peas 10 minutes before dumplings are done. I like my veggies on the side, not in the chicken and dumplings. You may be tempted to use a biscuit mix to make dumplings. WHY? Making your own takes about 60 seconds longer than a mix and taste 1,000% better. They're lighter, fluffier and more tender. Try it! For a darker gravy, roast onions and chicken giblets (NOT the liver) until golden brown, combine with bay leaf, chicken pieces and broth and cook chicken. Add onion skin to broth for more color. You can also add a little strong, black coffee (not so much that you taste it). If you have any leftovers, reheat in microwave until just warm. Don't over heat and it is very good. CALORIES: Six servings at 416 calories. Remove fat from chicken and broth to reduce the most calories. Cut excess fat from chicken before cooking. Before thickening broth, let cool slightly so fat can be easily skimmed off. There is a lot of flavor in this dish, you don't need the fat. In a large pot or dutch oven, combine chicken pieces (include giblets EXCEPT liver) with onion and bay leaf. Cover chicken by two inches with water or broth, at least 6 cups. Bring to boil, reduce heat immediately and simmer until bird is tender and juice of chicken runs clear when thickest part is cut to bone, or meat thermometer reaches 170˚F for breasts, 180˚F for thighs or legs. Start checking for doneness after 30 minutes of simmering so you don't overcook it. When done, remove chicken, cut meat from the bone and pull or shred into bite size pieces (some people like bigger chicken pieces, cut it the way you like it). Strain broth and reserve 6 cups. Let cool slightly and skim off fat that collects on the surface. Thicken broth. Add 1/2 cup reserved broth gradually to flour and whisk until smooth. Slowly add to broth, stirring to blend thoroughly. Heat to thicken, until boiling. Turn heat to low and simmer while getting dumplings ready to add. If broth is too thick, add a little water. Make dumplings. In medium bowl mix dry ingredients. Work in shortening with a fork, pastry blender or your fingers until mixture looks like fine bread crumbs. Stir in milk. Add chicken pieces to simmering broth. Drop dumplings by teaspoon fulls (for larger dumplings use a tablespoon -- they will expand in size when cooking) into simmering chicken broth. Dumplings should sit on top of gently simmering liquid, not be submerged. Cook uncovered for 10 minutes. Cover and cook 10 more minutes. Test a dumpling to make sure it's cooked through. Serve immediately. In large saucepan or Dutch oven, melt butter. whisk in flour. GRADUALLY blend in broth, stirring to reduce lumps. Bring to boil, immediately reduce heat. Adjust seasoning with salt and pepper if necessary. Prepare dumplings as in above recipe. Add chicken to simmering broth. Carefully drop dumpling mixture on top of broth and simmer gently for 10 minutes. Cover and cook 10 more minutes until dumplings are done. leave Chicken and Dumplings Recipe.